Scott Barber returns as the head coach of the Jefferson Falcons baseball team. Returning for the Falcons will be: Nathan Jacobs, Andrew Vance, Colton Tackett, Gary Ghiz, Andrew Mehalic and Chase Sparks. Others expected to see playing time this year for the Falcons with be Seve Cantini, Billy Dye, Patrick Sartor, Tristan Griffith, Braydon Throop, Ben Gramsz, Lucas Woodworth and Aiden Orzechowski. “There will be many talented freshman pushing for varsity innings,” Barber said. The program goal for the Falcons is once again to be the best team in Ashtabula County and to try and compete for a league and district title. Like a lot of area teams the Falcons have been stuck working on drills inside. However, they were able to get outside on Saturday, March 9th and a few more times this past week. “We always stress fundamentals on defense and offense. We also spend a lot of time in the classroom learning the game of baseball. Our program has always played smart baseball and that seems to lead to more runs scored and wins in the end,” Barber said on some of the things the team is working on in practice. The strength for the Falcons this year will be their pitching staff. “The pitching staff is very talented and deep. I believe we have 6 qualify varsity arms that can be called upon,” Barber said. The Falcons kick-off the season with a double header against Lakeside on Saturday, March 23rd at Lakeside. The first game is scheduled to start at 12pm. 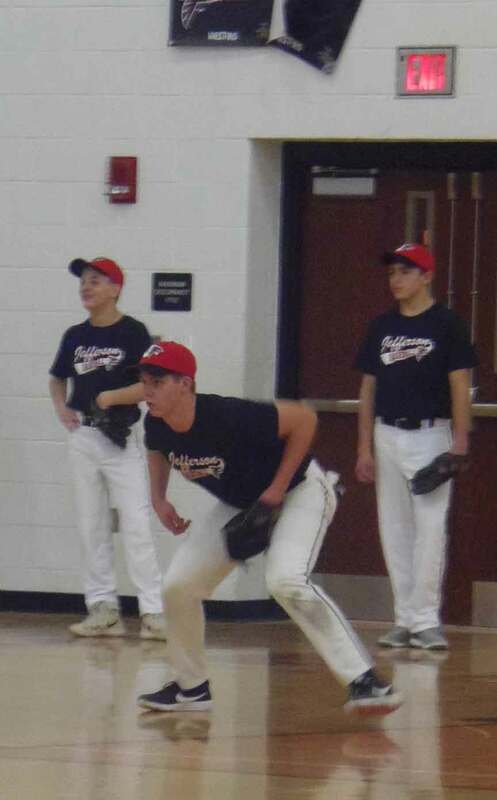 Pictured: Gary Ghiz, of Jefferson, gets ready to field a grounder during a recent practice.